They were doing the same thing when I got back this afternoon–they looked so bored. A lot of soldiering is just standing around, and these dudes (and almost all were dudes–I hope someone’s writing about the masculinity on all sides of this show) definitely had that part down pat. I got on my bike and rode over to the sports stadiums to check out the tanks and the public buses diverted for their use. There was a food truck there, and so many people lying around in the sunshine, some napping. I next headed to the Inner Harbor where troops were stationed in clumps along the bike lane, surrounded by cases of water, empty boxes from Pizzeria Uno, bags from the Cheesecake Factory, and bagel platters balancing on trucks and tanks that totally do not belong on the bike/ped path, but there you go. 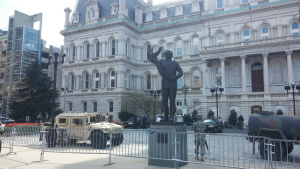 The Harbor was largely empty and stores were already closed, but managed to get an order of fries before heading over to City Hall where I snapped this picture of tanks and soldiers and a monument to a soldier in front of our fancy civic building. The block was ringed by media–even Anderson Cooper has found his way here–and it had the feel of everyone being way too early or way too late to a party. This city is loaded for bear, and I thought to myself, if nobody brings a fight, I wonder how many of these people will be kinda disappointed.